The capacitors used in the UK bulk buy. There used to be only two ways to get a suitable primary capacitor for a coil, buy a very expensive pulse cap, or build your own with aluminium foil and polythene. But now there is a better alternative. Terry Fritz and others have been experimenting with multi mini caps, replaceing a large hivoltage primary cap with an array of smaller capacitors. So far this approach has been very successful and looks like becoming the standard method for constructing primary caps, because it is cheap, easy, repairable, and clean. Use polypropylene capacitors only. Use many strings of small value caps rather than a single string of larger caps, so that the current load is shared out. Use bleeder resistors across every capacitor and don't interlink strings. Use a string whose total DC voltage rating is 1.414 times the AC transformer output voltage. ( So for my 8 KV AC transformer I need 8 of 1500V DC caps in series and I use 9. The capacitor should have metal foil end caps - the ones which are entirely of metalised aluminium construction will blow. Look for a dV/dt rating of at least 1000 V/uS. 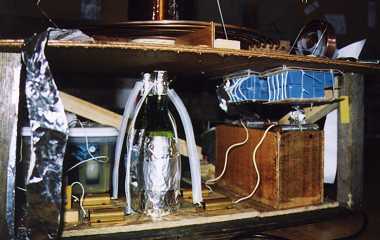 Alex's MMC - the stacks of blue capacitors in the right of the picture, the beer bottle caps are used as filters. Richie Burnett and I found these caps in the RS catalogue. Richie tested some of these to destruction they didn't blow until powered at over 3kV AC. Richie also ran an 8 by 8 block of these in his coil. I tried out a string of these caps in parallel with the 0.067uF cap on my coil, ( 200kHz, 8kV 250mA transformer). These ran fine with 6, 5 and even just 4 in series - these caps are only rated for 1500V DC each! I didn't have the courage to try 3. I then took out my old caps and put in an array of 5 strings of 6 caps - all 0.047uF, mixture of Farnell and RS equivalents. (The Farnell ones have a slightly smaller diameter and are rated for 2000V/uS. The RS ones seem slightly better made and are rated for 1800V/uS. - they are also cheaper - Farnell doesn't give a further price at 1000+). I was well impressed by the results - I was getting bigger and better arcs with 0.04uF total capacitance than I had been getting with 0.09uF in the old caps. Run times have to be limited in the garage - notenough room for the arcs - and even with the doors open - I prefer to limit my exposure to ozone. The caps were barely perceptably warm after a few short runs. We have now made a bulk purchase of these caps - 1350 caps for 6 coilers in the UK plus one in New Zealand. I have built and tried out 10 strings of 9 caps, total capacitance 0.052uF at 13500V DC. With a loan of Mike Tucknott's toroid I was getting hot 4 foot arcs. Terry Fritz has done a great piece of work in formulating power and reliability calculations for mmc caps. Since all these caps are made pretty much the same, one manufacturer's numbers are similar to another's as long as the construction is the same. I have pulled a lot of caps apart and there is really not any great difference beyond the label. axial caps are 33mm long 15mm dia, made by Arcotronics. terry wrote: I would say they are in the 40 - 50 range. I have a great data sheet from EVOX that is good for helping out this guessing . I'm also assuming that the dissapation factor tan delta is the same for all polypropylene caps. I also assumed that Ksync would equal 1 for a static gap. It is also assumed that all the heating occurs in the dialectric, and that the resistive heating in the foil is not significant. Terry wrote:All the data sheets I have seen have pretty much the same numbers for tan delta. Ksync is 1 for any gap that always fires at peak voltage. Only async rotaries would be 0.5. I never would have considered this but this happens to be what Chip is running. Resonant systems that fire a number of times during a cycle would be somewhere in between. These figures should show the correct trends but could be out by a factor of 2 or more! They are likely to be conservative - heat rise will be less than this. We could get the catalogue from Arcotronics and see if they give relevant figures, or we could just try running them hard and taking their temperature. Terry adds: The manufacture's numbers have a lot of guessing in them too and they "pad" the numbers to be safe. In general, these are all only guides. The "real" proof is in the running... of course, if the temps come out super high or the life is like 5 seconds, you can bet there is going to be a problem. I saw one manufactures "real" test data on TAN delta, the numbers were only 20% of what the caps were rated at! They are simply playing real safe in case someone makes them prove those numbers. I get the impression they were taking into account someone spilling pop in the cap winder too :-)) A number of places have done good testing but they don't quote those numbers because they don't want anyone to really design something to those numbers. They know a lot can go wrong on the production floor and they want to be sure there are no problems no matter what. (the life time in hours is the ratio between the rated AC voltage and the actual AC voltage raised to the power 15 and then multiplied by one million. Terry wrote: I took all the data sheets I have read, and drew life data from the caps we use at work, and churned them all together. The life numbers will be less than in many applications but Tesla service is very hard on the caps in that they go through almost 100% high power voltage reversals. It is "my" best guess. I tried a number of different situations and the numbers seemed reasonable to "me". Of course, if anyone has any better ideas feel free... Also, remember that most of the over voltage damage is being done simply by the 50/60Hz AC signal. I also guessed in some of the damage from the high frequency voltage too. It would probably be fairly easy to set up some test strings running with just high voltage AC and come up with more accurate constants... If you found anything neat, you could write a big paper and all the cap companies would come running... I should mention that the (Vo/V1)^15 function is very widely accepted and has been proven in a number of tests. It is just a matter of using the right numbers for the other constants. This is probably conservative - I did subject a string of 4 of these caps to 8000 VAC in parellel with the existing cap and they did survive a minutes run time! Terry wrote: That really does surprise me! Of course, the ionization mechanism may not follow the function at the extremes. But the function does predict they would die in microseconds... If you knew how long the string did last (a test) perhaps you could refine the equation. If you could get a few data points, you could really have a good idea of what the function is. It is interesting, we run some caps in applications at work that should die too. I initially got worried about that but they seem to run fine after many years with no failures... There are probably even more and perhaps unknown factors that add into all this. However, it gets to a point where you just have to take all the equations for what they are worth and just hope your cap lives... Temperature is even more complex because a fairly large number of failure mechanisms can come into play. Even 30 hours of run time is probably enough for years of use so it might be a while before we can verify the formula! I am glad you find some use in all this. It really is interesting to read through all the data and try and get inside the heads of the people that wrote it. I think they know a lot more than they say but they really want to be very conservative in any numbers they publish. They don't want to get blamed for messing somebody's project up so they figure it is better to far underrate than be wrong. One measure of how tough these caps are is how few MMCs we coilers have blown so far. I do not know of anyone who has blown any that were reasonably designed. That is far far better than our other cap designs have faired in their first attempts at using them in Tesla coils. I was a little concerned that all the "gurus" didn't take the ionization problem real seriously. They said if you don't cook them to death and don't overvoltage and arc them to death, they will last forever. I've used a PCB which is very expensive unless you luck on some big surplus boards as I did. I've finished one board 10 strings of 9 each with their own resistor. After I finished I thought of tying together two strings and using one resistor for each pair, still not too vulnerable to cascade failure and saving half the resistors. I've also used perforated boards from maplin for the expendable experimental multi mini caps. If I was using perf board for longer strings I would mount the caps vertically and tie them above and below the board. Or buy a sheet of the polythene glazing material from BnQ the acrylic is also suitable but tends to crack when you are working it. Drill and tie. or cut in strips. Or that U shaped plastic channeling, drill through it, tie and solder the leads underneath- leave a length of lead underneath so that you could tie resistors on the bottom. You can get it in just the right width. |O| 1.5cm Perhaps also leave a length of the channeling to allow you to extend the strings in the future. The end caps can be connected to bolts so that each unit could be mounted onto a couple of bus bars. I don't like the idea of caps in a pipe - all the joints will flex unsupported when you build it and you can't easily inspect the caps or touch them to see if they are getting warm. (Don't do that anyway if you have no discharging resistors). When I built my MMC I simply stacked the capacitors in an 8 by 8 block shape, (kind of like a hexagon pattern.) I then twisted the leads together at the ends and soldered the twisted ends with a generous amount of solder. a.) Go for poIypropylene only. b1.) will allow a better heat disappation (prevents premature cap death). b2.) usually is a sign for metal FOIL endplates (very important!). b3.) From b2, these caps have MUCH higher dv/dt ratings. b4.) Using metallized plastic ENDPLATES WILL result in cap failure (I tried and lost some Philips caps.). b5.) If you find any cap having a dv/dt less than 1000V/�sec, you can bet on them not having metal FOIL endplates. DON�T use these. c.) Leave a space between each cap row. This will allow any created heat to be carried away by air convection. d1.) it complicates the whole thing. Removing an interlinked string (for tuning or repairs) envolves lots more work. d2.) If an interlinked cap in a string blows(opens), you get unequal voltage distribution, that might lead to more problems. d3.) Design your setup, so that it is easy to pull a complete string. I mount mine upside down and use a friction fit to hold them in place. Pulling a string is a matter of seconds (only twosoldering junctions). d4.) Following d1-d3 makes the MMC very universal. This means you can use it for more than one coil. d5.) Cap killers are high BPS. This being said, stay away from BPS rates >>480+. Go for a bigger cap instead. Following John Freau�s posts have shown me that high BPS with a small cap will NOT lead to longer sparks than a coil with low BPS and a "correctly" sized cap. e.) I find equalizing resistors unecessary for equalizing the voltages across the caps. They do, however, safely discharge the whole MMC within a few seconds. The actual resistance is uncritical. This will vary with the number of caps used in a string, as you don�t wan�t to get too low on total resistance (wastes power and heats up the cap�s surroundings). a.) In order to stay universal, try not to exceed dv/dt too much. While (as Terry has shown) you CAN exceed dv/dt, you loose versatility doing so. What I mean is, if you build your cap on the limit (there are some $$ reasons making this legimate), for e.g. 120 BPS, then you won�t be able to run it at 240 bps, etc. b.) Calculate the maximum primary current. d.) As the current flows through each cap (in a string), the maximum allowed current is the same for one or 1000 caps in a string. e.) From b, now calculate the number of strings needed. h.) This sounds a lot more complicated than it is. You will need to fiddle with the numbers, but there are various possible combos. i.) In DW coils, the peak current is not being fed continiously. This is one of the reasons why we can run them "on the edge"
j.) Richard Hull once said that MMC�s are only good for coils in the <2kVA range. I disagree on this. The larger the input power, the larger the coil will be (following simple reasoning). The larger the coil, the lower the FRes is. As T = 1/F, the lower Fres is, the easier it is on the caps, because the cap has "more time", so the dv/dt rating becomes less critical. As we are using more than one string, we will divide the current up between the strings. In my present case, I am running ~600A primary current, but I am using 13 strings, so each string only sees 46A. I have run these caps with up to 65A per string and have had no failures. k.) Looking at T (from j), the steepest rise occurs during the 1st quarter, so this period is of true interest. dv/dt should be kept within limits, in order to stay universal. You don�t need to be super religious about it, tho. A 1.1x overrating surely won�t lead to premature cap death. Looking at our example cap, we see it will be very hard to actually exceed the rated dv/dt of this cap. (Okay, Greg Leyh might be able to with his ALF coil). b.) but doing so, will once again be a trade-off in universatility. c.) Most manufacturers test their caps at 2-3 x Vdc. They must survive this for 2sec (IEEE standard). d.) Following a and d will give you a good measure of safety against strikes, kickbacks, etc. Keeping Vdc within limits gives you great amounts of safety, in case anything goes wrong. However, there is absolutely no need to go for a rating equal to the one we are using for rolled poly caps. The rolled poly caps have the BIG disadvantage of being self rolled and using non uniform, non virgin material. The MMC does not have these disadvantages. Let�s take another look at our example cap. It is rated for 16.5kVdc. Terry has shown, these will fail at 5kV PER CAP, so our example cap will fail at 50+kV. This (with the proper use of safety gap) rating should be high enough for at least a 12kV, if not even for a 15kV xformer. It is exactly this DC failure rating (5kV for a 1650V rated cap), which lets me say it is useless to go for really high voltage DC caps. Some of the GTL members do not agree, for whatever reasons, and they went ahead and ordered the 6kVdc units. (which is why I sort of lost out, as I too ordered caps) If you give Richie and my 4x Fmains SRSG idea a try, the "failure time" is only 5ms. This means, if you can keep the voltage within limits for the 5ms, the SRSG needs to fire the next time, there will be no danger for the MMC. Vdc is should be rated so that you *should* never exceed it in normal usage (1.41*Vac) and 2-4x this DC rating should match the possiblilty of a strike to the primary (so that the MMC will survive). Greatly raising the DC voltage rating (i.e: using caps that have very high DC voltage ratings; WIMA 6kV) is a waste of money, because the DC rating really only tells you the voltage peak (single pulse case) the caps will survive. There is no use in designing your caps, so that they will survive 150kV, if your xformer lets go at 20kV. (I hope you see what I mean to say). b1.) Internal heating: As we are using one of the lowest loss materials (PP) and our run times are limited to <30 minutes, this is of no real concern. Unless we really push them hard, they should not get too hot. PP should not be run above 105�. However, this is internal temperature. As we do not know how fast the heat convects to the outside, I would say the outside should stay below 40�C. 40� is slightly uncomfortable to the touch. b2.) Keeping the rows seperated by 1/2-1" will allow plenty of ambiant air to circulate and cool the MMC. I don�t think a fan is necessary. If a fan (must be) used, I would go to the trouble to filter the air. You don�t want dirt, etc to build up on the caps. This will reduce heat transfer and might lead to flash overs. b3.) Following b1 and b2, a small HF coil, powered by a tube or FET, will need other considerations. As I have not built one of these, I can�t comment on them, but I would think an MMC for such a coil will need different construction thoughts to keep the temperature down low. b4.) Higher temperatures will soften the dielectricum and degrade it�s electrical properties. This will cause a change in capacitance and punch-through resistance. This is of no real concern in the AC (de)rating for CW coils. We should never experience ANY sort of real heating within the caps. Caps that get hot, are telling us something is wrong and you had better find out what the problem is. c1.) Partial discharges. This is a problem, because it is the slow death of a cap. This doesn�t become obvious on the first run. Side comment on WIMA�s 6kV vs 2kV: Partial discharges also can not explain why the DC->AC derating factor is so rotten for the 6kV units. c2.) Partial discharges occur within the cap in voids, air bubbles and entrapped dirt particles (see my mail on partial discharges in the archives). Fortunately for us, the manufacturer does everything, he can, to prevent this from happening. Commercial cap material never sees human fingers. The high tech envolved (thin layers, virgin material, high pressure rollers, vacuum degassing chambers, etc, etc) lets the cap survive the hell we put it through. c3.) One thing to remember is that the manufacturer (de)rates his caps for 24/7/365 usage. 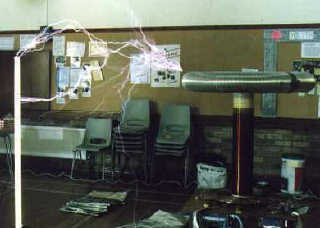 Our coils do not see this kind of operating enviroment. Further more, caps are rated for 10,000-100,000 hours of operation. The MTBF (mean time between failures) is rated in Gh!!. To make things more clear, lets use an example. For our needs, 2000h are more than enough. Furthermore, let�s say we run our coil for 30 minutes per day, every day. For 2000h, this means we can run our coil for 2000h/0,5h = 4000 days. 4000/365 = 10.95 years!! This is more than enough, I think ;o). c4.) In order to keep partial discharges within (what I claim to be) safe values, I would suggest staying below the factor 2.5. I.e. : your 1500Vdc caps (450V ac) should be run at or below 1125 Vac. The lifetime does not go down linearly. I haven�t made a graph, but from gut feel, I think with a 2.5x Vac overrating, you will be able to reach a 1000 hr. life span with ease, running the coil as described above. Hardly anyone runs their coil EVERY day of the year. If we further say, we only run every other day, we will still get a lifetime of ~11 years. This value should not be totally overrated in order to get a reasonable lifetime out of the MMC. A factor of ~2-2.5 seems "about right". We shouldn�t forget this is a statisical value and not ALL caps will go at once. As the MMC is built in a modular form, replacement of single (even if it is a few) caps is not too difficult or expensive. If you are (generalizing here) short on cash or just want to experiment around and take a shortend lifetime into account, you can exceed this rating up to maybe a factor of 3-5 (i.e: your caps 1300-2250Vac each). Considering the cost of a rolled poly AND the fact that it becomes a doorstop, once it has failed, I think the MMC has good chances to become THE standard in coiling. I can see no problems with current capabilities (section 1), peak (DC rating) voltage capability (section 2), as long as it is sensibly matched, and no real problems in lifetime vs AC rated vs. AC useable voltage (section 3). Terry's thoughts on Reinhard's great collection of MMC knowledge. >c.) Leave a space between each cap row. This will allow any created heat to be carried away by air convection. This may also save nearby caps if one blows. >d1.) it complicates the whole thing. Removing an interlinked string (for tuning or repairs) envolves lots more work. >d2.) If an interlinked cap in a string blows(opens), you get unequal voltage distribution, that might lead to more problems. Poly caps may self heal if one were to short. Interlinking would defeat this by allowing much greater current to flow into a momentary short which would reduce the chances for a successful healing. I don't recommend cross linking now. It also defeats the ability to select various strings to adjust the caps value. >d5.) Cap killers are high BPS. This being said, stay away from BPS rates >>480+. Go for a bigger cap instead. Following John Freau�s posts have shown me that high BPS with a small cap will NOT lead to longer sparks than a coil with low BPS and a "correctly" sized cap. I think you can go to any BPS just as long as you do not exceed the RMS current limit of the MMC. For very high break rates, you will need lots of strings. >e.) I find equalizing resistors unecessary for equalizing the voltages across the caps. They do, however, safely discharge the whole MMC within a few seconds. The actual resistance is uncritical. This will vary with the number of caps used in a string, as you don�t wan�t to get too low on total resistance (wastes power and heats up the cap�s surroundings). >j.) Richard Hull once said that MMC�s are only good for coils in the <2kVA range. I disagree on this. The larger the input power, the larger the coil will be (following simple reasoning). The larger the coil, the lower the FRes is. As T = 1/F, the lower Fres is, the easier it is on the caps, because the cap has "more time", so the dv/dt rating becomes less critical. As we are using more than one string, we will divide the current up between the strings. In my present case, I am running ~600A primary current, but I am using 13 strings, so each string only sees 46A. I have run these caps with up to 65A per string and have had no failures. I think MMCs can be adapted to running any size or break rate coil. It may take an unreasonable number of caps in some cases. Other than just too many caps to deal with, I know of no fundamental power, current, voltage, or BPS limits that an MMC could not be designed to handle. In fact, an MMC could be very heavily over designed for critical show coils and such. WIMAs seem to have more air voids in them than other brands. I wonder if they are more worried about the "ion inception level" (where ionization starts in small air pockets causing slow damage to the dielectric). I don't think that would be a concern in our low MTBF (mean time between failure) use. Everyone in the industry seems to ignore AC ratings and worry about RMS current. >b1.) Internal heating: As we are using one of the lowest loss materials (PP) and our run times are limited to <30 minutes, this is of no real concern. Unless we really push them hard, they should not get too hot. PP should not be run above 105�. However, this is internal temperature. As we do not know how fast the heat convects to the outside, I would say the outside should stay below 40�C. 40� is slightly uncomfortable to the touch. I would get very worried if the caps get five degrees C hotter than the surrounding air. Of course, we won't be using them in 80 or 105 C ambient conditions. >b3.) Following b1 and b2, a small HF coil, powered by a tube or FET, will need other considerations. As I have not built one of these, I can�t comment on them, but I would think an MMC for such a coil will need different construction thoughts to keep the temperature down low. As long at the RMS current is within the cap's ability, they should perform just fine in any continuous AC application. That is what everyone else uses them for. >c3.) One thing to remember is that the manufacturer (de)rates his caps for 24/7/365 usage. Our coils do not see this kind of operating enviroment. Further more, caps are rated for 10,000-100,000 hours of operation. The MTBF (mean time between failures) is rated in Gh!!. To make things more clear, lets use an example. For our needs, 2000h are more than enough. Furthermore, let�s say we run our coil for 30 minutes per day, every day. For 2000h, this means we can run our coil for 2000h/0,5h = 4000 days. 4000/365 = 10.95 years!! This is more than enough, I think ;o). >c4.) In order to keep partial discharges within (what I claim to be) safe values, I would suggest staying below the factor 2.5. I.e. : your 1500Vdc caps (450V ac) should be run at or below 1125 Vac. The lifetime does not go down linearly. I haven�t made a graph, but from gut feel, I think with a 2.5x Vac overrating, you will be able to reach a 1000 hr. life span with ease, running the coil as described above. Hardly anyone runs their coil EVERY day of the year. If we further say, we only run every other day, we will still get a lifetime of ~11 years. If the caps run cool and you don't go over their voltage rating by more than 25%, they will probably never fail. I would ignore the AC voltage ratings. The old 3X voltage rating rule was for the handmade caps where things just were not perfect. We now know that caps do not see large voltages unless they are resonated without limit but then, they or the transformer will still blow.